As early as 1971, the Central Bank of Ireland announced its intention to produce new banknotes to replace the long-lived Lady Lavery issue which had been printed by the Bank of England in London and circulating in Ireland since 1928. 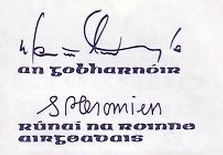 They sub-contracted the design phase to Servicon – an Irish design company, to design the notes of the denominations; £1, £5, £10, £20, £50 and £100. The theme chosen for these notes was history of Ireland, and each note featured the portrait of a person with this theme in mind from a particular era from historic to modern, alongwith ‘complementing’ visual elements. The female head painted by Sir John Lavery was retained from Series A as a watermark and appeared in the blank space on each design. Foreign collectors found it difficult to legally acquire examples of the £50 note since, for much of the period of circulation of this series, foreign exchange controls prohibited the export of any notes larger than £20 from the Republic of Ireland. Of course, this probably didn’t cause too much of a problem for ‘determined’ collectors. This ten pound note was issued between 1976 and 1982 by the Central Bank of Ireland, being replaced in 1993 by so-called “C Series” banknotes. Obverse: The predominantly purple-coloured ten pounds had a portrait of Dean Jonathan Swift the poet and satirist. The background contains a reproduction of the coat of arms of Dublin from a city council resolution against a letter by Swift from April 1735. Reverse: The back of the note featured a portion of a map of Dublin which was published by John Rocque in 1756 – showing Great Abbey Street, Batchelors’ Walk and Aston’s Quay – now known as Middle Abbey Street and Aston Quay. respectively. In between, as all Dubliners know, flows the River Liffey, or Anna Livia to the poets among us. 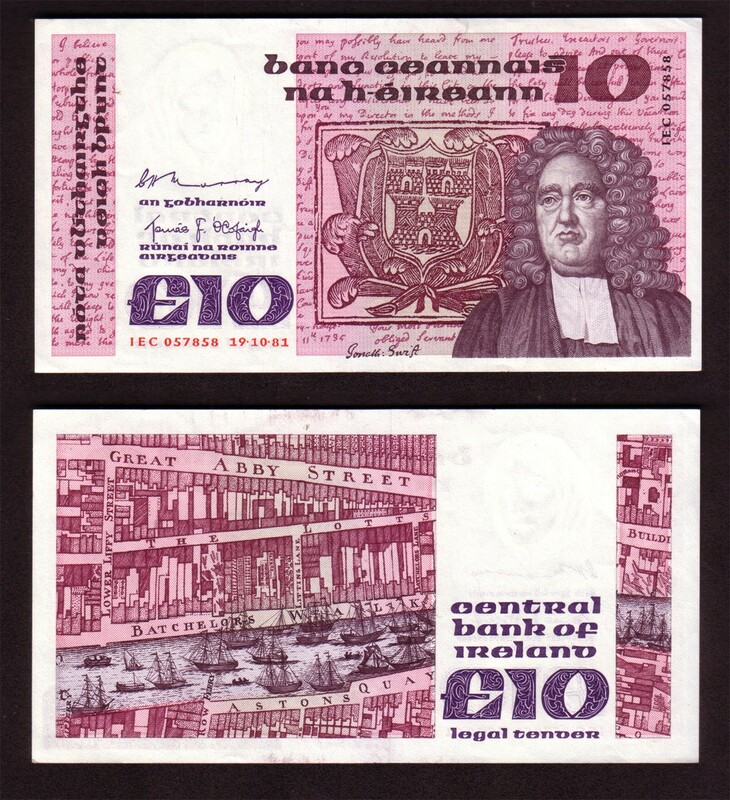 1981 B Series £10 Banknote – Jonathaan Swift, the sometimes controversial Dean of St Patrick’s Cathedral in the 18th C.
John (Jean) Rocque moved to England with his parents, who were French Huguenot émigrés. It is hard to understate Rocque’s importance – while other mapmakers had issued such large-scale maps before, no individual had attempted such a broad range. Rocque is now mainly remembered for his Map of London. He began work on this in 1737 and it was published in 24 printed sheets in 1747. It was by far the most detailed map of London published up to that time, and remains an important historical resource. In addition to his work as surveyor and mapmaker, Rocque was an engraver and map-seller. His 1756 map of Dublin featured the Area around Dublin City on a series of four maps. They extended as far as Skerries and Cardy Rocks to the North, Carton House (Maynooth, Co Kildare) to the west, Blessington, Co Wicklow to the south west, and Enniskerry (also in Co Wicklow) to the south. How many “B Series” £10 notes were issued? A total of £3.353 million worth of these banknotes were issued. 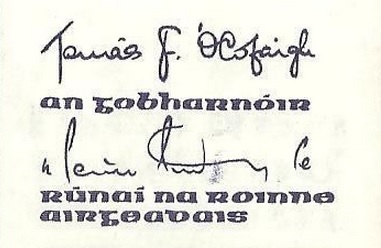 There are 3 main varieties of this banknote, according to the signatures that appear on left-hand side of the note. Jonathan Swift (1667–1745) was an Anglo-Irish satirist, essayist, political pamphleteer (first for the Whigs, then for the Tories), poet and cleric who became Dean of St Patrick’s Cathedral, Dublin. He had a ‘cutting’ turn of phrase and rarely held back in his criticism of others. He also a very dry sense of humour – once suggesting that the poor of Dublin should eat their young – instantly solving the population explosion of poor people and the food shortages that seemed to be ever present. 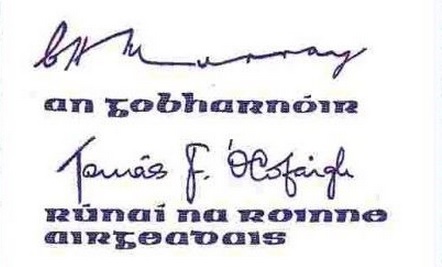 Despite this, he was immensely popular and, in some circles, is considered an Irish patriot. He was born into a literary family with all sorts of interesting connections on both sides of the family. His grandmother, Elizabeth (Dryden) Swift, was the niece of Sir Erasmus Dryden, grandfather of the poet John Dryden. The same grandmother’s aunt, Katherine (Throckmorton) Dryden, was a first cousin of Elizabeth, wife of Sir Walter Raleigh. His great-great grandmother, Margaret (Godwin) Swift, was the sister of Francis Godwin, author of The Man in the Moone which influenced parts of Swift’s Gulliver’s Travels. His uncle, Thomas Swift, married a daughter of the poet and playwright Sir William Davenant, a god-son of William Shakespeare. From a literary viewpoint, Swift is remembered for works such as Gulliver’s Travels, A Modest Proposal, A Journal to Stella, Drapier’s Letters, The Battle of the Books, An Argument Against Abolishing Christianity and A Tale of a Tub. He is regarded by the Encyclopædia Britannica as the foremost prose satirist in the English language, and is less well known for his poetry. He originally published all of his works under pseudonyms – such as Lemuel Gulliver, Isaac Bickerstaff, M.B. Drapier – or anonymously. He is also known for being a master of two styles of satire, the Horatian and Juvenalian styles. From a numismatic viewpoint, he is the Mr Drapier that published those nasty Drapier’s Letters accusing the English government of foisting underweight copper tokens on the poor people of Ireland, instead of proper money.